This recipe uses rough puff pastry, which has the same texture as puff or flaky pastry but is much easier to make. The tarte can be assembled up to 4 hours in advance before baking. 1. For the pastry, place the flour in a mixing bowl and add 175g of the butter, the lime juice and 125ml ice-cold water. Mix with a roundbladed knife until the mixture forms a soft dough, adding a dash more water if the mixture feels dry and flaky. Turn the dough out onto a floured surface and knead lightly to bind. Dust the rolling pin with flour then roll out the dough to make a rectangle about 30cm long and 15cm wide. 2. Fold the bottom third of the dough up and the top third down to make a rectangle of 3 layers, keeping the edges straight. Press the side of your hand into the pastry on each side of the rectangle to seal the layers together. Give the pastry a quarter turn. Repeat the rolling, folding and turning 4 more times then wrap the pastry in clingfilm and put it in the fridge for at least 30 minutes to rest. 3. Preheat the oven to 200°C, gas mark 6. Butter the sides of a 24cm-round, 4cm-deep cake tin with a fixed, solid base. Finely grate the ginger into a bowl, collecting any juices and discarding any fibrous parts of the root. 4. In a small pan, heat the sugar with the lime zest and juice until the sugar has dissolved. Bring to the boil and boil for 4–5 minutes until the syrup turns golden around the edges. (Watch the pan closely during boiling, as the syrup will quickly caramelise). Carefully dip the base of the pan in cold water to prevent further cooking. Stir in the remaining butter, and the ginger to make a smooth sauce. 5. Pour half the sauce into the prepared tin so it coats the base in a thin layer. Peel, core and quarter the pears then pack the pear quarters into the tin, some rounded-side down, some cut-side down. Press them down firmly in an even layer. 6. On a floured surface, roll out the pastry thickly to make a 25cm circle, using a plate or bowl as a guide. 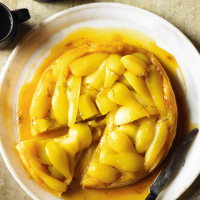 Lift the pastry over the pears, tucking it down inside the edges of the tin to cover the filling completely. Bake for 35–40 minutes until the pastry is well risen and golden. Leave in the tin for 5 minutes before turning out. 7. Meanwhile, gently reheat the remaining sauce. Loosen the pastry around the edges of the tin with a round-bladed knife. Place a large plate on top of the tarte then invert it onto a plate. 8. Cut into slices, pour over the sauce and serve with crème fraîche or Greek yogurt. The tarte can be assembled up to 4 hours in advance before baking. If you don't have a 24cm-round shallow cake tin, the tarte can be baked in a similar-sized frying pan with an ovenproof handle. Take care when removing it from the oven.